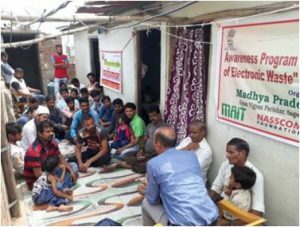 Madhya Pradesh Vigyan Sabha has organized E-waste awareness programs in three locations in the occasion of World environment day June 05. One program was organized at the premises of Pollution Control Board, Mode of program was Puppet show, film show, discussion, lectures, painting competition, group discussion, exhibition etc. 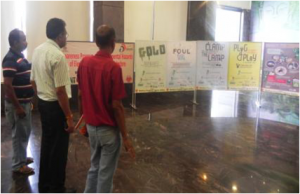 Officials of pollution control board have been participated in the workshop enthusiastically. Mr. R.K.Gupta, Regional Director, Pollution Control Board and Chief Engineer Hemant Sharma jointly inaugurated the program. In this occasion Mr.Ashish Pare, MPVS has given a lecture on the importance of environmental protection and importance of forest and water conservation. 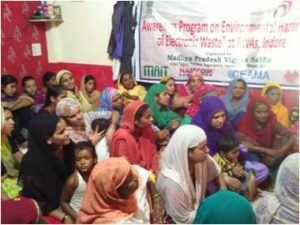 He has linked the impact of electronic waste on environment and need of environment protection and safe disposal as well as management of E-waste. In this program 200 persons participated. Second program was organized at Play Gorund, Manavata Nagar, Kanodia Road, Indore where more than 150 persons participated. Local Cooperator Smt. Chandrakala Malvya and President of Seva Sansthan Shri. Mukesh Patel were also present in the occasion. An exhibition prepared on Bus was also present near the venue. The program was attended by some NGO representatives viz. 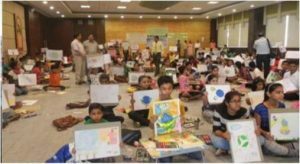 Ms. Priti Sagore, Pratyaksha Samaj Seva Samiti, Mr. Kirthi, Mr. Neelesh Shindey from Nav Chetna Nirwan Social Welfare Society, Children’s Science Centre Indore are some names to mention. 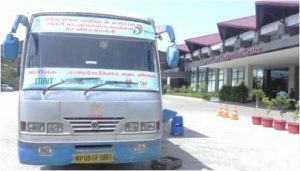 Apart from above 150 participants hundreds of peoples were got aware of E-waste campaign through running Bus exhibition. Some moments of the program; Third program organized in cooperation NEEV Sanstaha at Khajrana area which includes Children’s rally, visit of exhibition and workshop. 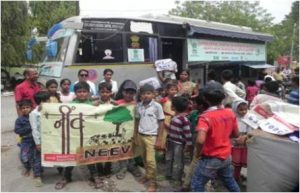 E-waste awareness rally of children went through Goyal Market and also covered Ring Road, Indore. 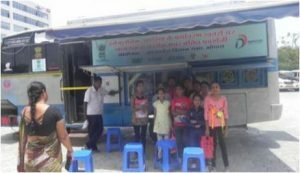 The program was attended by around 40 children from different schools in the locality as well as general public. Ms. Kiren Pankudi of NEEV sansthan and Mr. Ashish Parey conducted the program as resource persons.